Oats have long been one of my go-to fast breaking meals. But, after one too many times under or overcooking oats on the stove I resorted to a more foolproof, and better for you, alternative – soaked overnight oats. I haven’t looked back since. Last week I was explaining to a colleague why he too should switch to soaked oats – as he waited patiently for his oats to cook…..and funny enough when the microwave ‘pinged’ his oats had splattered all over the place…..
1. Easier digestion: Soaking overnight breaks down both the starches and phytic acid – both of which can make cooked oats uncomfortable on the digestive system. 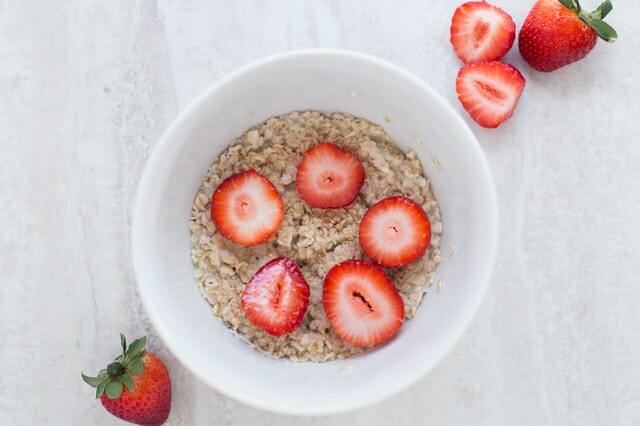 Put simply slow soaking oats make them more digestible. 2. Better nutrient absorption: The phytic acid in oats can act against nutrient absorption. Soaking them breaks down the acid allowing your body to better absorb all of that good stuff that oats contain like iron, zinc, potassium, magnesium and fibre. 3. Saves time and hassle: Soaking oats is quick and easy. All you need to do is re-purpose a glass jar or container (I use old coconut oil jars). Throw in 1/2 cup of each of (ideally organic) rolled oats, water and yoghurt/milk plus any extras and then pop in the fridge. Soaked overnight oats are even more delicious and nutritious when they’re ‘pimped’ – jazzed up with added extras. Like chia seeds, pumpkin seeds and flax seeds, psyllium husk, cinnamon and coconut flakes. An easy way to enjoy your oats pimped is to let someone else do the hard work of mixing the added extras. By this I mean add to your oat base (or use instead as your base) a bircher or muesli style mix. Like the one I’ve been enjoying from The Bircher Bar. 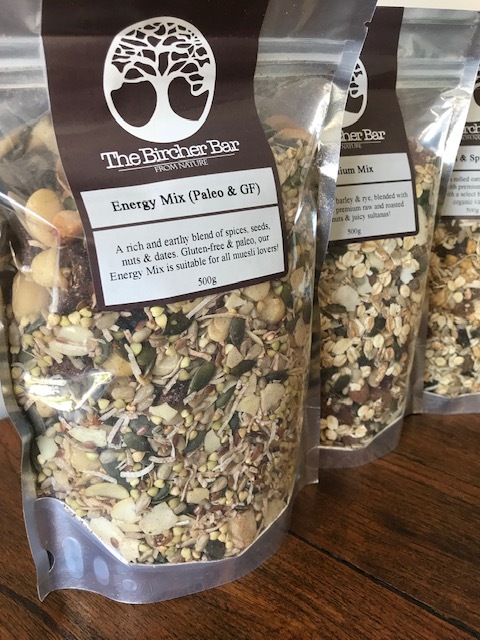 The Bircher Bar creates all natural, handmade and small-batch breakfast blends and they launched as a humble market stall in the Northern Rivers of New South Wales. Now I’m very fussy about anything I don’t make with my own hands from scratch and I obsess over ingredients labels. I did the same with The Bircher Bar’s products – and was pleasantly surprised. Their muesli blends are full of good for you, mostly organic ingredients. 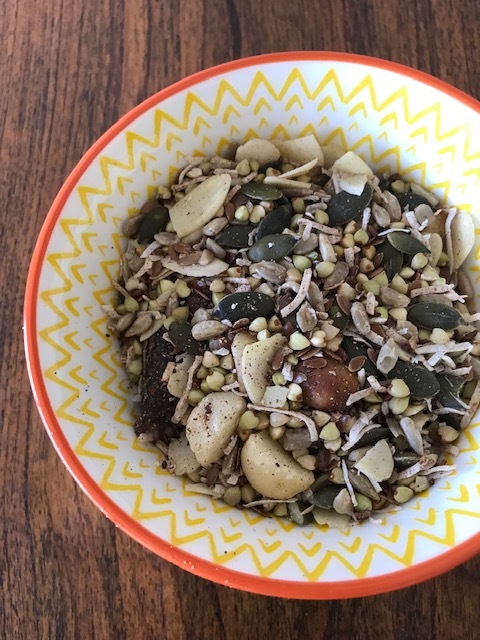 Take for example the Energy mix – it’s paleo and gluten free and contains buckwheat, macadamia, flaked almonds, pepitas, sunflower seeds, shredded coconut, cinnamon, cacao, linseed and dates. Not surprising then when The Bircher Bar sent me some samples I quickly got hooked on adding 1/4 cup of one of their lovely mixes to ‘pimp’ my soaked oats……let this be your inspiration to not only soak your oats but to pimp them too! Tags: benefits, healthy, oats, overnight, soaked. Bookmark the permalink. Glad I’ve inspired you – let me know how they go….so much better than the microwave! This is fascinating! I’ve always done this, but never realized that there were benefits, besides the oats softening! When we visited Scotland, Ireland, and a couple places in northern England, you had to order your oats the night before, which I thought was really interesting. Great post! Thanks Chef Mimi and I too didn’t appreciate the full benefits until I started researching for this post. Love that you order the night before in the UK! !